Members of the RSL at the Commemorative ceremony to welcome back the refurbished gun. 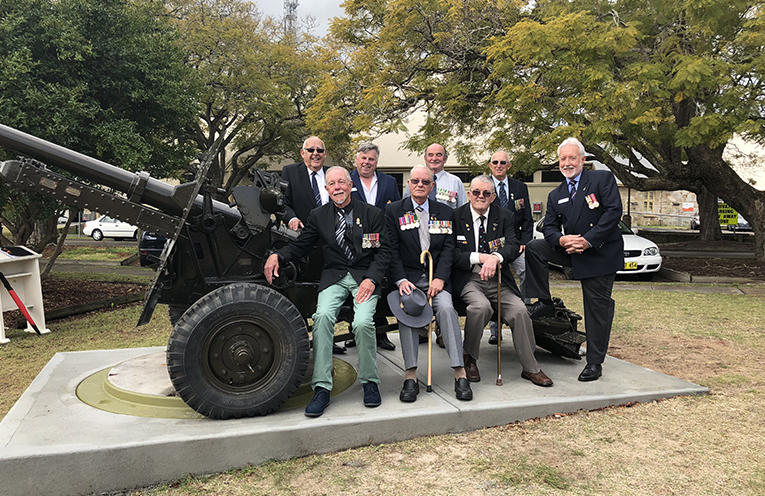 IN January of this year, the Raymond Terrace RSL Sub-Branch secured a sponsorship from AGL as part of their work with the Australian Veterans Employment Coalition (AVEC) to undertake a refurbishment project on the 25LB artillery piece (the Gun) located in ANZAC Park, Raymond Terrace. While the Gun was away being refurbished the RSL Sub-Branch funded the construction of a new concrete slab for the Gun in a new position within the Park. The refurbished Gun was relocated onto its newly positioned slab on 14 August, 2018. 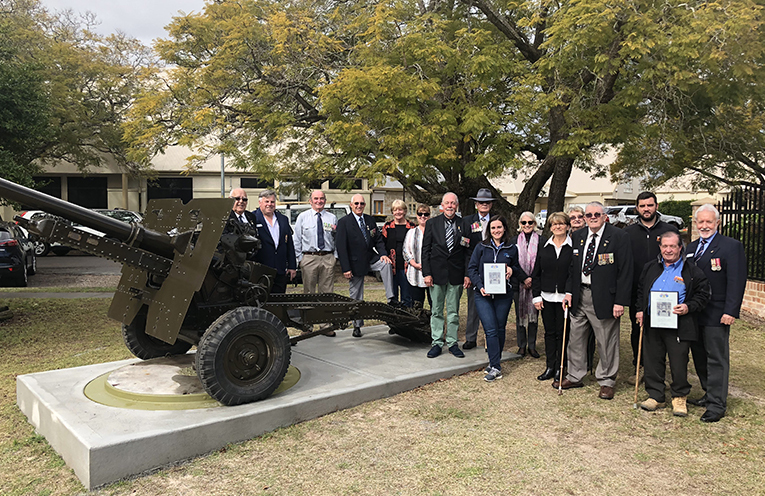 An official ceremony was hosted by the Raymond Terrace RSL Sub-Branch to commemorate the return of the refurbished Gun, and publicly acknowledge the generous sponsorship of AGL Energy Limited towards the cost of the refurbishment and relocation of the Gun. The history of this special artillery piece, and its arrival in Raymond Terrace, has its own story. In the early 1950’s, the Raymond Terrace Junior Chamber of Commerce decided to purchase a piece of equipment to be placed in the park on the southern side of Raymond Terrace. The Australian Army was contacted and it advised that a Quick-firing 25LB Mark II gun was available from the Bathurst Ordinance Depot for £5.00 ($10.00). It then cost £26.00 ($52.00) to have the gun transported to Raymond Terrace by rail. In 1992, the gun was relocated to ANZAC Park and is one of only a few to be mounted on its swivel ring. The British-designed, Quick-firing 25LB gun was the primary field gun used by Commonwealth forces during World War II. 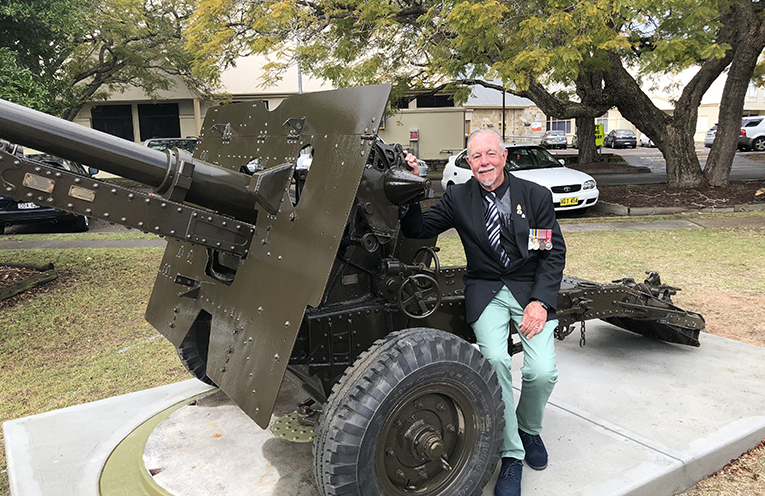 In attendance at the commemoration ceremony was Mr Kerry Allen, whose father Raymond Allen served in New Guinea in the Second AIF Artillery Core, and likely used one of these very guns in battle. Having been exposed to the elements in ANZAC Park since 1992, the 25LB gun had deteriorated and was in urgent need of refurbishment and preservation. 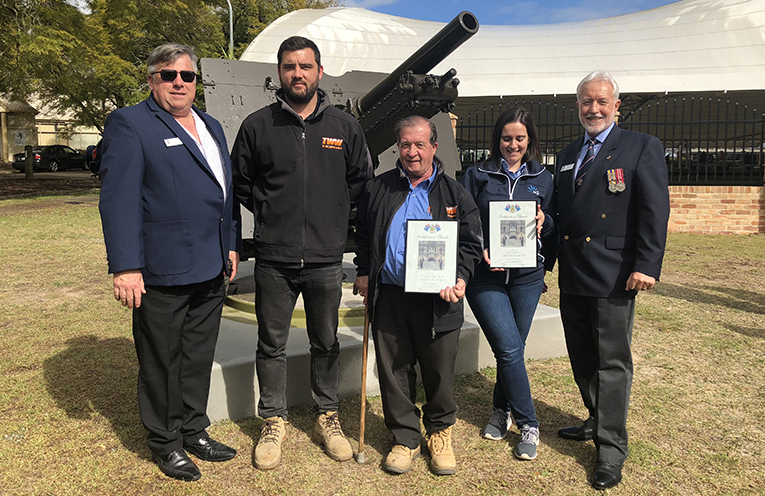 As the nominal ‘custodian’ of ANZAC Park, the Raymond Terrace RSL Sub-Branch approached AGL Energy Ltd seeking sponsorship for the restoration project. AGL has a long history of supporting local organisations, groups, events and programs which benefit the local community, and the Raymond Terrace RSL Sub-Branch was most appreciative of their grant. Arrangements were made with T.W. Woods Construction of Tomago, to undertake the preservation and restoration work on the gun between March and May of this year. The preservation and relocation of the gun was in accordance with the Sub-Branch’s ‘ANZAC Park Re-Development Project’ plan. The RSL Sub-Branch considers that there is a requirement to re-develop ANZAC Park in order to preserve the current infrastructure of significant military and historic significance within the Park; improve the layout of the Park so that it is able to accommodate the large crowds who attend commemorative services held at the War Memorial; and provide a safe and attractive environment for the public and other visitors who attend activities held in the Park into the future. Kerry Allen, whose father served in New Guinea, using artillery like this piece. Special guests in attendance at the ceremony. 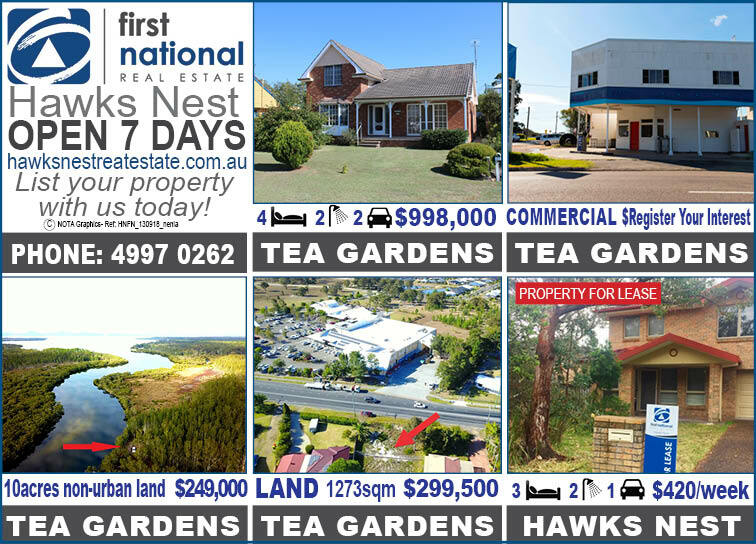 Special guests from T.W Woods Construction, AGL and the Raymond Terrace RSL Sub-Branch.